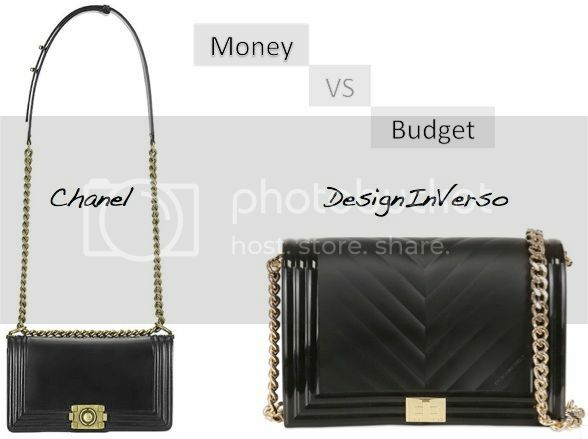 Trying out something new with this 'Money vs. Budget'-category. I hope you like it! I'm totally against brands who shamelessly copy a coveted it-item and even more when they claim it to be the 'real deal'. I remember walking into Sac d'Anvers a while ago, finding myself surrounded by fake Balenciaga's. There wasn't a Balenciaga-tag or anything like that, but they were exact copies. The fact that I was holding my own Balenciaga, made it even worse. Oh, the horror! I am, on the other hand, very aware that most high street brands take inspiration straight from the runway to design their own collections. There's absolutely nothing wrong with being inspired by someone or something. That's what I want to achieve with this new category on the blog: showing you an highly coveted item and telling you where you can find a similar version, inspired (not copied) by the real deal. Chanel's Boy bags have been around for a while now and I have a feeling they're here to stay. I love them, worship them even, but that bloody price tag... There's no way that it'll be hanging on my shoulder in the near - or far - future. While I was browsing the LuisaViaRoma-website (the bag section, to be more precise), I came across this bag from DesignInVerso. I immediately had to think about the Boy, without feeling sick to my stomach because of my 'copy issue'. Another bonus? It costs about 125 euros, which is kinda awesome compared to the 1000 + euros you - without a doubt - will pay for a Boy bag. Leuk! Ik vind stiekem de budget tas veel leuker! Leuke nieuwe soort posts! Ik vind deze een mooie inspiratie! Ik haat echte replica's ook.. maar inspiratie waar het gewoon een mooie tas is die iets weg heeft van een andere vind ik wel kunnen! De tweede tas vind ik wel leuk maar de 'echte' vind ik toch het aller leukst! Leuke post. Zolang er geen Chanel-logo op staat en echte fake is, vind ik het wel kunnen. Mooi alternatief. chain tasjes zijn altijd leuk! oh ik heb wel veel lookalike chanels :p omdat ik zo dat vierkant printje erg mooi vind :$ en ik ben ook niet vies voor namaak :$ al ga ik niet alsof doen dat het een echte is hoor ! €1000 aan een handtas geven kan ik ééécht wel niet! Leuk idee voor posts! En wat betreft de tassen, geen enkele tas haalt het natuurlijk bij the real deal, maar deze is wel gaaf! Je hebt helemaal gelijk over die exacte kopieën, vreselijk. Ik heb ook liever een tas die er iets van weg heeft qua model, is hier wel gelukt. Great post. I was checking continuously this blog and I'm impressed! Very helpful info particularly the last part :) I care for such info much. I was seeking this certain info for a long time. Thank you and best of luck. O, I wish I was in that position!